The space-cruiser Hypercube glided into the Crossroads’ station docking clamps with all the showy elegance that a ship of its price should have. Nicole Merison, the pilot, owner, and sole occupant of the Hypercube, shut the ship’s engines down and put the rest of its operations on standby. With the ship safely locked down, Nicole grabbed a space-compression bag and headed off to enjoy Crossroads’ atmosphere and markets. She’d been in deep space a long time, and, though she enjoyed the solitude, she was looking forward to the station’s hustle and bustle. Nicole’s first stop was at her favorite food kiosk, where she ordered a spicy Golan wrap and asked after the local news. The proprietor, a short, stout alien with a pug face, told a story, probably a tall tale, about an entire alien civilization appearing, almost instantly, on an asteroid a few star systems away. Bauro laughed and said he didn’t know why a nice girl like her took jobs with the government anyway. Nicole shrugged and pointed out that it was a government job that paid for her ship. She enjoyed her outlandish lifestyle, even if it did mean occasional freelancing for the Expansionists. Moving on, Nicole stopped at a few fruit stands and picked up some choice pieces, fresh from the sun gardens of Zeta’ini III. She kept the fruit, along with a few other finds, in the space-compression bag flung over her shoulder. Then, Nicole headed for the station’s communication center to check for messages. She was halfway hoping there wouldn’t be any… She needed the work, after spending all her savings on the Hypercube, but that didn’t mean she was looking forward to it. Fortunately and unfortunately, Nicole found a message from the Department of Coordination for External Operators (DCEO) waiting for her. She considered ignoring the note; she had enough liquid assets left to get by for a while. Maybe, though, the mission would be interesting. The message did say to report to Prefect Galvin, her usual contact, immediately. Nicole decided to play along and headed for the government offices in the center of the station. Most of the government offices were housed behind large, curving, plexi-glass windows. The DCEO was no exception, and as Nicole walked past Pre. Galvin’s office, she tapped her hand, in time with her step, on the window. Pre. Galvin, a large woman, with black hair, and dark skin, looked annoyed. She always looked annoyed around Nicole Merison, so it was the only way Nicole had seen her. Nicole couldn’t imagine working behind those huge windows: too much like living in a fishbowl. “You’re staying then?” Pre. Galvin asked in her deep, rumble of a voice. “Lucky for me.” Then, keying a code into her desk panel, Pre. Galvin called up an image of the Banti’phi asteroid field, a few star systems away. “Recognize this?” she asked. “Right. Which is why it was a cruiser like you who first found this…” Pre. Galvin zoomed the image in on one of the larger asteroids, and a series of tall, metallic, cylindrical buildings with bridges between them became visible on the asteroid’s surface. Nicole raised her eyebrows and waited, realizing there might be more to some tall tales than she’d expected. “Your scientist?” Nicole asked, hoping the answer was yes. Nicole closed her eyes: Cora and Wespirtech. Those were the last two names she wanted to hear. She never said them, if she could avoid it, herself. They were names she was trying to forget. “Your history together doesn’t matter,” Pre. Galvin said. “You like freelancing for the government, and we’re offering you a freelance job suited to your talents. Fifteen thousand electro-marks on completion and five thousand as a down payment.” Pre. Galvin didn’t even have to address Nicole’s threat to shoot Cora: the Expansionist government had Nicole’s personality profile, and they knew she wouldn’t go through with something like that. Nicole, for all her flare, was a good girl. Nicole sat for a moment, remembering her time at Wespirtech. Remembering was disturbingly easy. She hadn’t forgotten as well as she’d hoped. “Tell me about the aliens,” Nicole finally said. “I’ve never known you to offer me a fee that’s equal to what a job’s really worth,” Nicole countered, but, deep down, she knew she wasn’t doing it for the money. She just wished she knew what she was doing it for. All she did know, at that moment, was that there are some jobs you don’t haggle over. Nicole set her ship on autopilot for the trip from Crossroads to the Banti’phi asteroid field. She meant to use the free time studying up on all the Expansionist records of cephalopoid races… only, there wasn’t much to study. The Human Expansion hadn’t run into many sentient, cephalopoid races. Most of the information available was limited to studies of Earth I’s base animals: squids, octopi, cuttlefish, etc. It wasn’t much to go on, so, without that to occupy her mind, Nicole ended up thinking about Cora, instead. What could Cora have done to upset a cephalopoid race? If they didn’t talk, they wouldn’t be bothered by her tone of voice, or the self-righteous things she said. And, Nicole didn’t see how Cora could have done to them what she’d done to her. Suddenly, Nicole imagined Cora lying on a cold floor, beaten by slimy aliens. That was a good image. She wondered if that was why she had taken the job: a chance to see Cora at her lowest. Arriving at the asteroid she sought, Nicole pulled the Hypercube into a long, slow arc, giving her a chance to get a good look. The cylindrical buildings looked about like they had on Pre. Galvin’s screen. Nicole picked a likely outcropping of rocks near them, riddled with caves, to hide her ship in, and flew in for the landing. So far so good. With the ship landed, Nicole looked out the windows, across the rocky, barren, surface to those alien buildings, stretched into the night-black sky. Nicole shuddered. She had her reservations about working for the government, but she loved the excitement of the jobs they found her. It was better than the stuffy research done at Wespirtech. Maybe she owed Cora a debt of gratitude for bringing her first career to its sudden end. If so, she didn’t feel it. Nicole dressed herself for her stroll across the asteroid in a loose fitting, all-purpose, gray jumpsuit. She’d paid plenty for it, but it was the only comfortable space suit she’d ever found. The seams around the neck, wrists, and ankles sealed right into space helmet, gloves, and shoes. When those weren’t attached, it could be worn like any other jump suit. A new algae pack in the back of the helmet would keep Nicole good for air for several days… but, god, she hoped this mission wouldn’t take that long. Finally, Nicole grabbed an extra, less expensive, and less comfortable space suit, along with her standard tools to shove in her space-compression bag. If she did find Cora alive, she’d bet anything Cora wouldn’t be wearing a space suit. Nicole rolled her eyes. Cora always was the type needing to be saved. Although, Cora would certainly have denied it if anyone ever told her so. Once the Hypercube was locked down, Nicole made a beeline for the alien buildings and didn’t bother looking for a door. She had the tools to make one: a high energy laser knife and a flexi-glass bubble. Nicole pulled the flexi-glass bubble around herself, facing its opening to the cylindrical building’s outer wall. Inside the bubble, Nicole had to crouch down; it was just big enough to hold her that way. Then, she pulled off the tape covering the sticky edge around the bubble’s mouth. She pressed the mouth firmly against the building’s outer wall, and the bubble sealed in place, ready to hold whatever atmosphere might be inside. Nicole cut her entry with the laser knife, and, once the atmosphere equalized, she carefully shoved the plate into the building ahead of her. Her hand-scanner told her the atmosphere was good, so she took off her helmet and gloves, shoved them into the space-compression bag on her back. Inside the building, Nicole replaced the metal panel in the wall behind her, hiding her homemade entryway. The map that came up on her echo-infra-meter’s screen showed the building to follow this general plan: the perimeter of the building was a thick toroid, laced with winding, cramped passageways much like the one Nicole was now crouched in; the center of the building opened up into a large hollow area, cylindrical like the outside of the building. Most of the infrared occurrences were in rounded rooms nestled among the winding corridors. Then, crossing her fingers, Nicole scanned for the characteristic radio wave transmitted by the tiny implant she knew Cora must have. The Expansionist government used those implants in all of its official personnel sent on dangerous missions. Of course, they only worked when the operatives remembered to turn them on and when they weren’t being held in shielded areas. Fortunately, luck was with Nicole today. Cora was too optimistic about her own importance, and therefore certain rescue, to forget to turn on the transmitter. She was being held near the top of the building. Nicole spent a moment weighing her odds in a wide-open space with few aliens against her odds in a mazelike series of closed in spaces with lots of aliens. She decided to bet on the wide-open space and headed towards the center of the building. At the very least, Nicole intended to see what the wide-open area looked like. She didn’t take these jobs just for the money; half the fun was exploring strange and forbidden alien civilizations. That was her specialty. As Nicole followed the passages towards the center of the building, she took a detour to see one of the larger, rounded rooms. Nicole approached the room and could see white light spilling out of its opening, into the darker hallway. Once inside, Nicole found that the light emanated from panels in the walls. The light flashed and played around the curving wall of the room like the flickering lights on a Christmas tree. There were no buttons, switches, dials, or any other obvious kinds of controls — the panels of dancing light were perfectly smooth. Nicole reached out to touch a panel and caught her breath as the room went dark. Then, point-by-point, the light returned, tracing out the shape her hand made on the wall. Curious. Nicole wanted to learn more about the lights… were they part of a computer somehow? or merely decorative? But she knew she had to move on. With a growing desire to see the elusive cephalopoids, Nicole approached the end of the tunnel leading to the giant, open, room at the center of the building. She cautiously looked out of the opening and caught her first glimpse of the aliens. The huge, stories-high, cylindrical space before her was laced with long straight poles, stretching from floor to ceiling and occasionally from wall to wall, across the giant room’s diameter. The one, curving wall that defined the space was riddled with openings to tunnels like her own. It was a strange structure. Yet, the building’s structure was oddly suited to the tentacled creatures, much like Earth I’s octopi, Nicole saw moving in their strange, complicated dance before her. Nicole pulled out a mini-magolucar to get a closer look. Nicole zoomed the magocular’s view in on a cephalopoid crawling out of a hole, across the building from her. Its tentacles, which numbered nine, were gray and curvaceous. They grew radially out from the base of the cephalopoid’s oblong, sack-like body. Where tentacles and body met, the cephalopoid’s yellow and intense eyes were set. There was nothing resembling a face, but the stretched skin around the eyes, and the eyes themselves, were extremely expressive. The alien looked suspicious, alert, interested. Nicole was intrigued. Where had these aliens and their buildings come from? Why were they here? Nicole watched as the cephalopoid deftly maneuvered itself away from the tunnel entrance and across the large room, by way of the light gravity and the many long poles. Long tentacles reached to one pole, grasping with the underside of sucker-disks, as other tentacles lightly let go of the last pole. With nine tentacles, there were always enough. The cephalopoid was a gracefully and efficiently built creature, and its motion showed it. Nicole was suitably impressed. She knew she would find climbing the poles to the top of the building much harder. Still, it was time to try. Rifling through her backpack, Nicole located two of the most useful devices she always carried: a light grenade and an ultra-dark. The ultra-dark was an eye patch, meant for people who had trouble sleeping. It was extremely effective at blocking unwanted light. The light grenade was extremely effective at providing unwanted light… at least, light that was unwanted to anyone who saw it. Nicole always arranged not to see it, and she definitely wanted it. With a deft swing of her arm, Nicole flung the live grenade high into the air. The low gravity gave it a long, graceful arch. In fact, Nicole had the ultra-dark safely over her eyes, before the grenade showed any proclivity for falling back down. Usually, Nicole knew when the grenade went off from the shrieks of pain it elicited. This time, the grenade’s detonation was eerily silent. Nicole counted to ten and pulled off the ultra-dark. At first, Nicole was afraid she’d killed them. The cephalopoids, who had all been shades of white to gray, were now as black as ash. They clung to the poles, shuddering. Blackened lumps of tentacles, wrapped around themselves in fright. It was their shuddering that allayed Nicole’s fear: they were just shocked. Perfectly natural. Knowing time was limited until the effect of the brilliant flash wore off, Nicole jumped from the tunnel’s mouth into the open space before her. She grabbed a pole and flung herself, hand over hand, upward, switching from pole to pole whenever convenient. Traversing the giant room in this manner, Nicole made it to the top, well before the cephalopoids could regain their sight. She found a large opening, larger than the other tunnel entrances, at one side of the ceiling. From the echo-infra-meter’s map, she knew it led to the area where Cora’s signal came from. Nicole pulled herself into the opening, and cautiously followed the tunnel towards those rooms. Nicole found herself in an area that felt much more normal to her than the confined tunnels and the giant, open room with the poles. These rooms at the top were more human sized, and they were filled with complicated machinery. Perhaps it was some kind of lab. The walls glittered with panels of flashing lights, like those she had seen before. Nicole ducked behind a large tank filled with a luminous fluid as she noticed several cephalopoids working with the machinery at the far end of the room. Their tentacles moved rapidly, deftly. They seemed to be doing a dozen things at once. Nicole wondered how she’d fare in a hand to tentacle fight with one of them. They didn’t look strong, but, then, their flowing bodies were probably ninety percent muscle. Not to mention that cephalopoids wouldn’t have any bones to break. Fortunately, these particular cephalopoids hadn’t noticed her, and Nicole managed to work her way around the back of the large luminous tank, remaining unseen. She found herself in the short tunnel leading to the room holding Cora. She drew a deep breath. She knew there was only one infrared reading in the room… Yet, she would rather have faced a room filled with wrathful, slippery, and immensely muscled cephalopoids. Cora was crouched in the far corner of the room, her arms wrapped around her knees, and her head leaned upon them. She looked asleep. She looked small. Nicole felt an ache in her heart for the hugs such a reunion might have involved if Cora had cared for her as she cared for Cora. Betrayal is hard to believe in: the mind rejects it, readier to forget a telling transgression than years of misinterpreted friendship. Nicole made herself walk towards Cora and found herself stopped short by an invisible force field. She reached her hand out and felt it repelled as if her hand and the empty air were both magnets. Nicole pulled out her echo-infra-meter and discovered that the empty space before, in fact, appeared as a wall on her map. Nicole spotted a control panel with actual buttons and examined it. After a little experimentation, she discovered the force field was easy to control from her side of the room. It created an ionization field that manipulated the air in the room. So, the invisible force field was merely a sheet of highly, unnaturally densified air. If Nicole manipulated the field, only slightly, she could cause all the air in Cora’s cell to be drawn into the wall… leaving Cora in a vacuum. Or, it would be just as easy to bend the field to fill Cora’s cell entirely… air would whoosh past her to flood the little cell, making it all as dense as the wall. Cora would be crushed. It would be even easier than shooting Cora. Nicole’s hand hovered over the controls as she watched Cora sleep for a painfully long time. She imagined a million things to say to Cora. In her mind, she heard herself make accusations… threats… demands… Instead, she simply turned off the force field and stood there. Cora looked surprised. “Nothing I could eat,” she answered. “You have a ship waiting?” Cora asked, hope in her eyes. “Have they experimented on you?” Nicole prompted. “Well…” Cora began but didn’t finish. Cora looked uncomfortable and voiced her distress in assertions of her outraged innocence. “I didn’t know it would make them mad…” Cora said. “Yeah, it’s right out there,” Nicole said beckoning to the tunnel she entered by. “Yeah, I saw that,” Nicole said. “That makes sense,” Nicole agreed. “So, I took a sample. It was just a small sample. I just wanted to scan it.” Cora’s voice was speeding up as she spoke. “They weren’t watching, I thought. They were talking to Gentry, the diplomat I came with. I didn’t think they’d care. I just wanted to know what the computers were made of… But they came rushing at me… Their skin was flushed red… They’d looked so small and delicate, and suddenly they were so large… scary… wrapping their tentacles around me…” Cora’s voice broke off entirely, as if it had sped up beyond the point where her mind could keep up with it. Nicole put her hand on Cora’s shoulder. “It’s okay,” she said, but her heart wasn’t in the attempt at comfort. She was too absorbed in this new problem: were the computers made of something valuable? Something rare? Something dangerous? Cora shook her head, looking down, probably still absorbed in her memory of the cephalopoids attacking her. Nicole enjoyed that image… but, she pulled herself away from it, returning to logic problem before her. Consumed in thought, Nicole walked over to the glossily smooth wall panel. As her shadow fell over the panel, Nicole thought she saw a slight sparkle fill the shape of her darkened silhouette. She placed her hand on the screen, and the screen glowed in response, as it had before. Nicole hadn’t yet decided what to do, and before she got the chance, she was startled by the glowing light spelling out the words “not Cora” in Cora’s handwriting. Cora and Nicole looked at each other. When Nicole looked back, the lights had spelled out “who?”, again in the only handwriting they knew. “Has it talked to you like this before?” Nicole asked. Nicole frowned. She had a hunch. “It would be easier if it could hear me…” she mumbled while tracing the shape of her own name on the panel, followed by a repeat of the question “who?” Of course, Nicole was not surprised when the panel sparkled archaically in response. She didn’t expect it to have a name… but she did think it deserved one. “Let’s go,” she said to Cora, suddenly worried. This time, Nicole decided to keep to the tunnels, avoiding the central, cavernous room. She would have liked to move quickly, but her need to avoid cephalopoids limited her to moving stealthily. With her echo-infra-meter held before her, Nicole led Cora downward through the winding tunnels. “We’re going to your ship now?” Cora asked from behind, and her voice echoed through the tiny halls. “Yes,” Nicole answered without stopping, without turning her eyes away from the meter’s map. As Cora finished her question, Nicole’s path-finding led them into one of the small rooms nestled among the tunnels. Panels lit up as they entered, swirling with light. Nicole led them away as quickly as she could. Nicole couldn’t see Cora’s face behind her, but Cora looked surprised, and then remorseful. For the last week, all she’d done was talk to the computers… rather, the living lights. She realized that she liked them. Cora and Nicole continued in silence the rest of the way. When, finally, they reached the tunnel Nicole had entered by, she went straight for the panel she’d cut in the wall. She pulled a second flexi-glass bubble from her backpack, so that she and Cora could seal the one behind them before rupturing the first. She began to remove the metal panel in the wall… but was interrupted by a loud knock ringing out behind her. Nicole and Cora both turned to see a cephalopoid, a single cephalopoid, in the hall behind them. 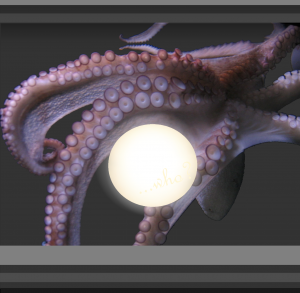 One tentacle was raised, wrapped around a transparent bulb. Lights played fitfully inside the bulb. The rest of the cephalopoid’s tentacles writhed, rhythmically, on the floor. It banged the bulb of light on the floor, and the knock rang out again. Nicole was paying attention; Cora was hiding behind her. The cephalopoid’s eyes were focused, clearly, on the intruders. The pupils of its eyes were black bars, across the gold intensity of the irises. Nicole felt they were piercing through her. Then, abruptly, the intimidating demeanor of the cephalopoid changed. The black bars narrowed into lines, and the cephalopoid looked as if it were smiling, almost laughing. The change was subtle, yet ubiquitous; effected entirely by the eyes and a stretching of the skin around them. Nicole noticed light blues and yellows flushing the fleshy skin of the cephalopoid’s tentacles. “Did the diplomat manage to communicate with them at all?” Nicole asked Cora, who was shuddering behind her. “Gentry?” Cora asked. “He…” but she trailed off as the answer appeared in two glowing letters: NO. “You can hear us,” Nicole said, now addressing the cephalopoid and the bulb of glowing light. “We travel together,” the bulb glowed. Then, after a darkened pause, the bulb beamed, entirely lit up. “The diatomes are shy…” were the words that followed the beam. “They write what I want to say,” the bulb glowed cryptically. “Yes,” the bulb, or rather diatome, agreed. “Will you let us go?” Nicole asked again, her curiosity overwhelmed by more pressing concerns: she worried that they might insist on keeping Cora. “Nicole can go,” the diatome glowed. “What about my friend?” Nicole was too worried to notice her word’s irony. Nicole could feel Cora getting nervous, almost frantic behind her. Cora stepped forward, “I’ll take it,” she said, hunger in her eyes. Nicole laughed nervously. “Sure,” she said. The diatome swirled with shining light as Nicole reached out her hand. Before the cephalopoid passed the diatome from its grasping tentacle, its alien eyes caught Nicole’s. She realized the trust she’d taken on. As the cephalopoid retreated into the tunnel, the pupils of its eyes widened to black bars, and the blush left its tentacles, a fleshy, placid gray. Nicole placed the diatome carefully in her space-compression bag, for the trip back to her ship. She exchanged a look with Cora and could see there would be no trouble over the diatome. Cora could make trouble, certainly, if she wanted. But, she was already building up her denial. She wouldn’t mention the cephalopoids or diatomes again. So, the government need never know about it. Back on the Hypercube, Nicole prepared her ship for the flight home to Crossroads station. As the engines powered up, she sensed Cora walk up behind her. “I could get you your job back,” Cora said. Nicole closed her eyes and put her hand to her head. Not an apology for causing her to lose her job in the first place; not even a thanks for rescuing her; just an insincere offer. “Sure you would,” Nicole said, finally nettled into responding. Nicole thought about it. She knew Cora was lying, but somehow it didn’t make her as angry as she thought it would. For all her idolization of those years at Wespirtech, it wasn’t really the heaven she remembered. In fact, it had been quite the opposite: the worst hell she’d ever seen, and Nicole had seen the inside of quite a few alien dungeons, torture chambers, and prison cells. The difference was that angry aliens are honest about the horrible things they plan on doing to you. Nothing at Wespirtech had been what it seemed. Suddenly, Cora was surprised. She clearly hadn’t expected Nicole to be so uncouth as to take her up on the offer. “I will,” she said. “I mean, I’ll try. I don’t know if they’ll believe me now. It was so long ago. But I’ll try,” Cora finished, lying. Nicole smiled. She knew now why she’d taken the job. It was time to move on, and she couldn’t do that while still hating Cora; and she couldn’t stop hating Cora while she still believed in their lost friendship. She had come to see Cora at her lowest. Only, Cora’s lowest wasn’t lying beaten on the floor of an alien cell; it was standing up on her rescuer’s ship and lying through her teeth to the woman who’d saved her life. Nicole looked at her new companion, the diatome resting on Hypbercube’s dash. She wondered about all the places it had been. The diatome was beginning a new phase of its life, choosing to travel with her. Nicole supposed she was beginning a new phase too. She liked starting out together with this strange orb, happily singing in patterns of light.